So there I was, lying in bed with my newly reset PDA phone wondering: could I write a blog post using just my mobile phone, a WiFi connection and include images. Jane and I were looking online to see where we might spend a couple of nights this week. 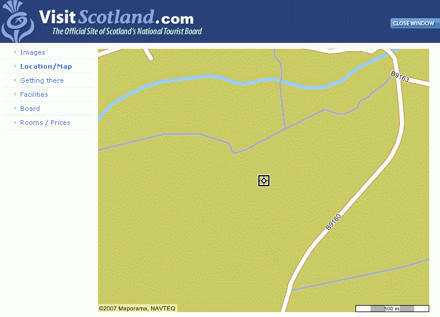 So we checked out the Visit Scotland website for accommodation in the Highlands. What possible use is that?! We’d want to get there by car … and not from the Information Centre (wherever that is!!). I knew there was a reason that I liked Nokia and Lenovo so much: they’re greener than almost every other big-name electronics firms out there. But they still have a way to go. I picked up this story back in April on the PC Pro website: Lenovo out in front in green race. It’s sat in my “to blog” folder ever since. How green is your gadget? It was referring to an electronics guide from Greenpeace where they assigned points (out of ten) to the major mobile and PC manufacturers based on their global policies and practices on eliminating harmful chemicals and on taking responsibility for their products once they are discarded by consumers. In August 2006 Lenovo were sitting at the bottom of the league in a very sorry 14th place (of 14). Within seven months however, the Chinese company who bought out the PC-manufacturing arm of IBM, had managed to completely turn around their green credentials and were leading with 8/10. From December 2006 to March 2007 the advertisers’ favourite Apple were bottom of the league on only 3/10. By June 2007 the situation was a little different: Apple had moved to a little over 5/10, making Sony the worst — having not moved at 4/10. While Lenovo had slid to about 7.5, with Nokia overtaking at 8/10. Something certainly to bear in mind when choosing a new PC, laptop, mobile phone or other shiny gadget. 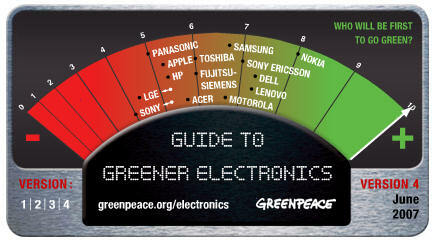 You can read Greenpeace’s Guide to Green Electronics online. 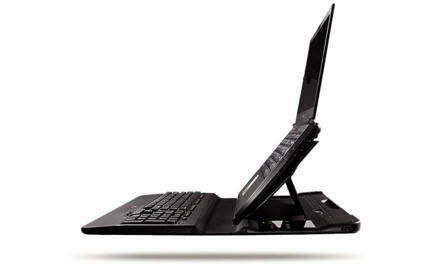 This looks quite cool: the Logitech Alto adjustable laptop stand with integrated keyboard. It plugs into a free USB port on your laptop, gives you a screen at eye level and a full-size normal keyboard, and has a built-in 3-port USB hub too. Costs about £50 though. Last night my conceptual model of how my favourite RSS reader, FeedDemon, works when synchronizing with NewsGator online changed. A good conceptual model allows us to predict the effects of our actions. Without a good model we operate by rote, blindly; we do operations as we were told to do them; we can’t fully appreciate why, what effects to expect, or what to do it things go wrong. As long as things work properly, we can manage. When things go wrong, however, or when we come upon a novel situation, then we need a deeper understanding, a good model. So a conceptual model is just the picture we have in our heads about how we think something works. My RSS reader of choice for the last few years has been FeedDemon, now at version 2.5. One of the newest features that FeedDemon offers is the ability to synchronize feeds with NewsGator, an online RSS application. This is really useful if you frequently work from more than one PC (e.g. home, work and laptop) as you can add/edit/delete your feeds in one place, and see the changes reflected in your other locations. Nothing. No new posts since Friday. Hmm … so I did a refresh. No new posts. So I went online and checked it on NewsGator itself. Again, nothing. 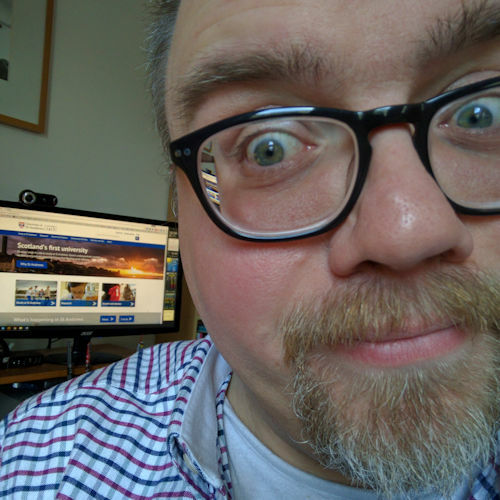 My good friend Solo Bass Steve was online, so he checked his RSS reader … it was fine: the latest post had published out. The problem I reckoned was then with my copy of FeedDemon. Uninstalled FeedDemon, resynchronized — no joy! Removed my blogs folder from synchronizing with NewsGator – refreshed the feeds: BINGO! At the same time I checked it on my laptop (which was still synchronized) and the new posts suddenly appeared. I checked the clock and it had just passed the hour. Things were becoming a little clearer. My conceptual model of how FeedDemon works in synchronize-with-NewsGator mode was this: I thought that FeedDemon simply sent NewsGator a list of all the feeds that I’m subscribed to and then downloaded the various posts itself. I regarded the online version as essentially a master list of all my subscribed RSS feeds, which I could access from the three PCs I regularly work from. I thought that when I started FeedDemon it check its own list of feeds against those on the master list, update the list as appropriate and then allow FeedDemon to visit each of my 100+ subscribed-to websites and download the latest posts. That’s what FeedDemon does in standalone mode: it downloads the feeds as-and-when, either on a predetermined schedule or manually when prompted. My PC is in the middle, synchronizing the list of feeds with NewsGator on the left, and then on the right pulling in the feeds from my subscribed sites. But based on my tinkerings last night it would appear that not only does FeedDemon simply synchronize the list with NewsGator it also pulls in the latest feeds from there too. It would appear that NewsGator only updates its feeds at a predetermined interval (e.g. once each hour) — which is fair enough for a shared, online service — and it is based on that last automated check which posts FeedDemon actually pulls in, using NewsGator as a proxy. So, for example, if NewsGator checks for new posts at 10:00 pm, and someone publishes a new blog post at 10:05 pm NewsGator will not pull that in until after 11:00 pm. My PC on the left connects to NewsGator’s server and pulls in the posts that it has already downloaded on its last scheduled check. That would explain why updating the feed to my blog didn’t pull in the latest posts: all I was asking FeedDemon to do was to reconnect with NewsGator’s servers and check whether it had pulled in anything new. I wasn’t actually checking that feed itself. It also saves the NewsGator server having to work unnecessarily hard pulling in data that is only going to be accessed intermittently. That’s the compromise that has to be made, I guess, in offering an online synchronized service like this: you can have synchronized feeds but at the cost of them being at most 59 minutes out of date. However, there seems to be no way to either manually update NewsGator’s list (by logging into your account and requesting a manual update) or change how often it checks for new posts. I just wish that this had all been made clear: when you change from the standalone mode to synchronized mode you’re now accessing your feeds via the NewsGator proxy rather than the live feeds themselves.